Google's inexpensive means of streaming internet media to TVs may well see a new explosion of content partners now that the search company is unlocking the crucial Chromecast software development kit. The Google Cast Software Development Kit (SDK) is now available to any software developer who wants to stream their apps or websites to the stick. With the software open to all devs, we should see an explosion of compatible movie, TV show and music apps thanks to the Google TV dongle's very nature. Chromecast streams content directly from the user's mobile device or computer, meaning developers don't have to develop specific apps tuned to Chromecast. Instead, they simply update their apps on tablets and smartphones as well as websites to work with the SDK. 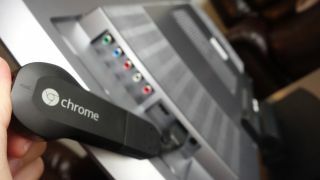 The Chromecast originally came to market with support for only streaming media acquired through the Google Play Store and on Netflix and YouTube. There are now over a dozen apps attending Chromecast's stream-fest, including Vevo, HBO, Pandora and a number of lesser-non titles. But thanks to today's announcement, that number will increase exponentially and likely, very quickly. While some devs may flee Apple TV's gated community, Google could run into some stiff competition against the Roku 3, which has lined up a virtual network of over 1,000 channels. We've got our fingers crossed that the Chromecast really works out for Google and TV, but in the meantime we'll keep track of all the new content you can watch as it becomes available. Google says hello software developers and good bye Motorola. Check out our review of their last Moto G love child.